After hearing these facts about the conditions that animals are forced to endure on factory farms you might be displeased to learn that 99% of all of the meat that is sold in the U.S. comes from factory farms (1), something to keep in mind. I know that these can be very hard to look at, it was hard enough to do the research for the article. However, if this is what it takes for people to wake up and realize exactly what they are contributing to, then I am all for it, as it needs to be done. I know a number of people who have gone completely Vegan after watching the graphic film “Earthlings,” which exposes the inner workings of factory farms. People are simply unaware of what has been going on behind closed doors, the intent of this article is to open some eyes and open the doors to this tragedy that has been taking place for far too long. 1. The majority of chickens raised on factory farms have their beaks cut off. 3. The term that comes across, as ethical “free range” isn’t at all, and in some cases is worse for the overall well being of the chickens than being kept in cages. 4. Newborn calves are taken away from their mothers almost immediately after birth. Calves born of dairy cows are not even allowed to drink the milk that their mother produces, ironically, that milk is for humans consumption only. See something wrong with this picture? The babies are then fed a nutritional supplement. Mother cows will wail for days and days longing for the bond with their newborn. They often go into depression and lose weight from the ordeal. Studies have shown that this gets particularly harder each time the cow gives birth. 5. More than 80 percent of the antibiotics used in the United States were fed to livestock. This statistic is almost sickening. Scrap that, it is sickening. The thought of this makes me sick to my stomach. Because these factory farmed animals are forced to live in such inhumane and disgustingly dirty conditions, these antibiotics are needed -and in large quantities to try and keep the animals healthy. If that alone isn’t alarming enough, the majority of these antibiotics are specifically administered to artificially increase rapid growth. (7) It is important to note that everything these animals are eating, we are then eating… you are what you eat. 6. Calves that are bred for veal are kept in tiny very dark containers called veal crates for their entire short lives. Because newborn calves that are male are not useful to the dairy industry and are considered a by-product. The male calves are kept in crates that are no more that 30 inches wide and 72 inches long. (8) These crates are small so that the baby calf has no room to move around too much and often times they are held down with chains to ensure that they don’t build muscle and their flesh stays tender. The calves are fed a diet that consists of only a synthetic formula so that their flesh will be pale and anemic, as desired by the consumer. 7. 82% of cows used for dairy production have their tails cut off. 8. 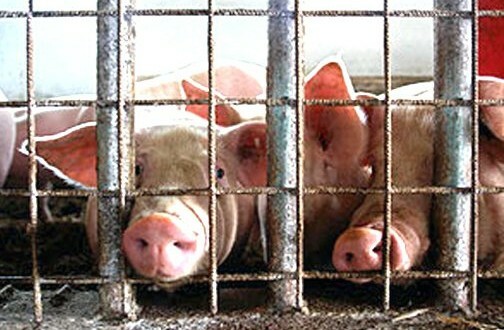 Pregnant sows are kept in disgustingly small cages and are unable to even turn around. Each year millions of pregnant sows are kept in cages that are referred to as “gestation crates.” These crates are a cost cutting measure that keeps the pregnant pigs immobilized. These crates have slatted concrete for the floors so that manure and waste from the pregnant pigs can easily slip through into huge pits beneath. 9. 65% Of Hogs tested from factory farms had pneumonia. 10. Almost all of the cattle raised on factory farms for the purpose of consumption are fed a diet that consists of GMO corn. Cows are naturally meant to eat grass. After reading this a lot of people will think, yes this is terrible, but what can I actually do to stop this? This is just how the world is. I want you to understand that you can make a difference. When you realize the tremendous feeling of anxiety that billions of animals are feeling at all times it is not difficult to assume that there could be a direct relationship between these extremely distressed animals and what many of us are putting into our bodies every single day. Another option is to do some research and find out exactly where the products that you are consuming are coming from. There are ways of getting meat and animal products that come from sufficiently more humane farmers with better, safer farming practices. Share this information with people. The majority of people who consume animals and animal products are just completely unaware of what is going on, you might be amazed to know that just a little information can go a long way if given to an open-minded individual.